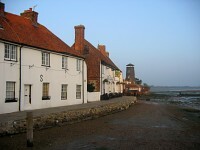 The Solent Way is a 60 mile footpath linking Milford on Sea with Emsworth Harbour, much of the path following the Hampshire coast line and passing through the New Forest. Through most of it's length you'll also enjoy views of the beautiful Isle of Wight, just a few miles off the Hampshire Coast. The path is generally way marked with a picture of a sea bird on a green background although the path also forms part of the European Coastal Path (E9) and some signs show this path too, or the name Solent Coast Path. 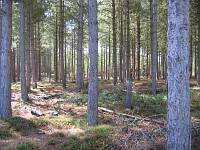 This site has photos and brief directions for all 60 miles of the path, split into easy stages. The Solent Way begins in Milford-on-Sea just to the south of the New Forest, with stunning views of the Needles on the Isle of Wight in the distance. 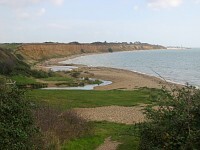 The path initially takes you on the sea front before heading down Hurst Beach on this impressive spit to Hurst Castle. 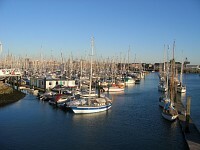 Returning from the spit, the path follows the coast through pleasant countryside round to the lovely port of Lymington. From Lymington the Solent Way crosses the Lymington River then continues a mile or so inland of the coast, giving occasional glimpses to the busy Solent to the east. Soon the path enters the New Forest passing Sowley Pond on the left walking on the quiet road for a little while to beautiful Bucklers Hard on the River Beaulieu. From Bucklers Hard the path follows the edge of the river to Beaulieu. This walk follows the path in the opposite direction, from the town of Hythe the path follows the coast on the edge of Southampton Water for a while before heading in-land on a wooded path into the New Forest. The path initially follows the edge of the New Forest then follows along the edge of the road into Beaulieu. After the peace and tranquillity of the New Forest this walk returns to the coast at Southampton. From the town quay (for the ferry from Hythe) the walk goes round the east of Southampton and across the Itchen Bridge. Descending down from the bridge the path soon re-joins the coast which it then follows all the way to Hamble-le-Rice, passing through the Royal Victoria Country Park on the way. 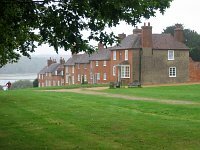 This walk is very rural in nature, starting from the town of Warsash on the banks of the river Hamble. From Warsash the path is soon quiet, passing a spit of land, popular with fisherman, then round the coast, with marshland inland and sea to your right, passing a caravan site. Beyond the caravan site the coast has cliffs, unusual for this part of the country, with the path following the cliff top round to Hillhead with it's small beach and harbour, then on into the larger town of Lee-on-the-Solent. 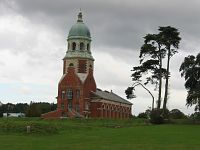 This walk has a variety of scenery, starting from the town of Lee-on-the-Solent and following the towns promenade into Browndown, an area still used as a firing range (so this part of the walk is not accessible if it is in use). Beyond Browndown the path comes out into Stokes Bay then inland round the suburbs of Gosport crossing the Haslar Bridge to come to the promenade and ferry over to the maritime city of Portsmouth, its' skyline dominated by the Spinnaker Tower. 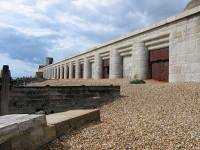 This walk pases through the only resort on the Solent Way, Southsea. 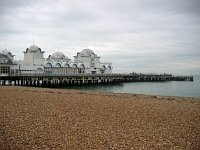 The Solent Way follows the promenade from Old Portsmouth along Southsea sea front, passing Clarence Pier, Southsea Hoverport, The War Memorial, Blue Reef Aquarium and South Parade Pier. Beyond South Parade Pier the promenade becomes much quieter and as you get towards the end the path turns inland through a residential area, then follows the eastern edge of Langstone Harbour, offering views to Hayling Island across the harbour. This walk begins from the Northern Edge of Portsea Island at Hilsea, returning to Langstone Harbour and crossing the bridge back onto the main land and on to Farlington Marshes. The path rounds the unspoilt marshes then continues on the banks of Langstone Harbour to skirt the edge of Havant before coming to the beautiful village of Langstone, by the bridge to Hayling Island, and on around the banks of Chichester Harbour to finish at the town of Emsworth on the Sussex border, the end of the Solent Way. Hampshire County Council publish a leaflet detailing walks on the path as well as a couple of books. In addition Ordnance Survey Maps OL22, Outdoor Leisure 119 and Outdoor Leisure 120 cover the length of the path, which is generally easy to follow as it runs along the coast for most of it's length.